Thermo Catalytic Systems Ltd. are industry experts in gas catalytic industrial heaters and oven systems, having pioneered the use of the technology over the past 20 years. T.C.S. Ltd. are European agents for the Bruest catalytic heater manufactured by Catalytic Industrial Systems Inc. in Kansas. Our systems are ideal for curing a whole spectrum of industrial coatings such as solvent based paint, water based paint and powder coatings. 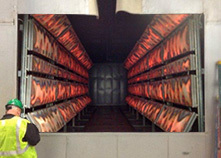 Our flameless gas catalytic heaters are ATEX approved for use in hazardous atmospheres such as paint spray-booths and ovens where solvent fumes may be present. Our long-wave infrared heaters cure most industrial coatings in a fraction of the time and energy cost of a hot air convection oven. Bruest heaters run on gas ( L.P.G. or natural gas). This means the running cost of our ovens is typically only a fraction of that of an electric infrared oven. We can demonstrate the effectiveness of our long -wave infrared heaters in your premises. We often have some ex-demonstration and reconditioned heaters that we can let go at unbeatable prices. So if you are looking for an ATEX certified heater that will keep your insurance company happy please don’t hesitate to give us a call. 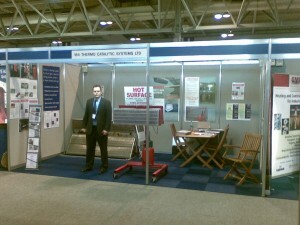 Flameless gas catalytic infrared heaters at the Surface World Exhibition,Birmingham N.E.C.